1, Spare Clothing – A well equipped common solider kept a spare shirt and a pair Hose & Socks in his snap sack, if he ever wet or wore through his main clothing. The shirt would have been a plain linen shirt, with drawstring cuffs, small collar and no yoke. 120 inches of material produced one shirt. sizes were probably 36″-42″ wide and cost around 2/9 per shirt. The hose & socks (NOT SHOWN) were made of woollen cloth, knitted wool, or linen, authentic stocking have the triangular dart running up from the ankle, during the English Civil War the price were around 15-17d a pair. 2, A spare shoe – Standard leather latchet shoes. These shoes were straight laced, which meant there was no left or right foot and they were issued in sets of three. The three shoes were worn in rotation, with one stored in the snap-sack. This meant the shoes wore down evenly on either side, and by adding one extra shoe to the issue the men could get many times the wear out of them. 3, Tinder box – Almost every soldier carried A fire lighting kit or a Tinder box or more commonly a pouch, essential for lighting the campfire for warmth, cooking, lighting match for musketeers or lighting pipes or candles, the contents of this box has been opened and is shown in the next box. 4, Flint, Steel, charcloth and sulphur splints – Before the invention of the friction match, the flint and steel were used with a good supply of charcloth , The metal piece called the steel is place in you hand and the flint is held in the other with a piece of chard cloth on top, the steel is then struck down upon the flint each time the flint is struck a shower of sparks is produced. Once a spark it will catch the chard cloth, and with a gentle blow, cause it to bloom. Once the cloth was glowing a sulphur splints was placed into the glowing ember, this will ignite like a modern match. 5, Dried leafs and Sticks – A handful of dried leaves and sticks would be handy to start a fire, the solider would light a sulphur splint from his tinder pouch and light a small amount of dry leaves, the small dry twigs were then added, then eventually large pieces of wood until the fire was fully established. 6, Musket balls – Extra musket ball were also carried , musket ball were made pouring molten lead into a mould. The casting spur shown on these ball would of been clipped close to the ball and any flashing around the circumference of the musket ball also removed. 7, Sewing kit (Brass needle, Spare buttons, Linen thread) – Although there is no evidence of a needle being issued it is likely that a brass needles were available to the common solider for everyday repairs to their kit. The common soldiers were generally only issued one jacket so general maintenance of the jacket was crucial, there are jackets that survive today in museums that are thread bare and heavily patched up. 8, A wooden bowl and Spoon – A wooden bowl and Spoon – Although eating equipment would of not been issued a wooden bowl and spoon would have been useful, durable and versatile, on campaign. It is possible that soldiers pooled the rations together and cooked a simple pottage in a iron pot. 9, Money – The common soldiers pay was around 8d a day (8 Old Pence) 4 Shillings 8 Pence a week. However he did not receive this much in hard cash, 5 pence was deducted for food, uniform, and his weapons, leaving him 3 pence and this was subject to arrears. 1 and half pence may be put aside and paid at a later date, as both armies found it hard to raise sufficient funds to pay the armies on time, leaving the common solider with only 1 and half pence a day. 10, A small wind instrument – The size of 17th century instruments was severely restricted by soldiers on campaign. Stringed instruments would not last long in a snap sack , they were also have been hard to keep in tune due to the outside environment. The most commonly used instrument would of been the large company drum or a fife, officially carried by each company. Other small wooden instruments would also of been possibly used. 11, Leather bottle – Again there is no evidence water containers were issued during the English Civil War. 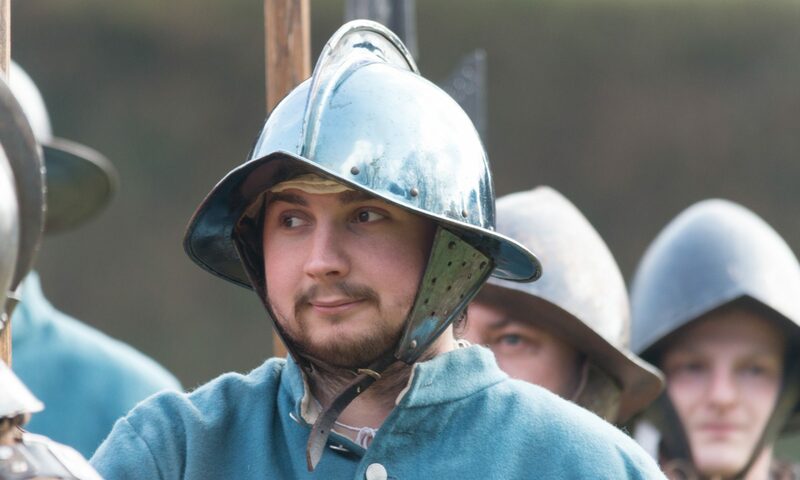 The common design shown here is a replica that was commonly used during the English Civil War, it would of stored any variety of drink from water, beer, to wine. The insides were treated with black pitch to keep them waterproof, and they came in different shapes and sizes. 12, Blanket – A blanket was tied around his chest and hung down by the soldiers side, there is not a lot of evidence for the common soldiers to get issued a tent and it was not until the Napoleonic era that the tents were issued to everyone. They either slept in the field under a hedge, in a make shift hut (hutting) or if they were lucky billeted in a village or town. A canvas sheet hung over a wooden makeshift frame was very common during the English Civil War, however the majority of time these were used to keep powder victuals dry. 13, Reading material – Reading material was made more available due to the invention of the printing press, both armies had the own propaganda rag, chap books were cheap and often humorous costing around 2d so they were affordable to the common solider. Ballads sheets usually with added or new words to well known songs, were often pinned up in the drinking houses. These were equivalent to today’s juke box. Also short religious tracts were very common during this period. A large majority of common soldiers in the Royalist Army were illiterate and the reading material were put to many practical uses in addition to that originally intended one being bum fodder, lighting , tobacco plugging bottles etc. 14, Games – The size of the game and the pieces were very vulnerable to be lost on campaign, some boards were made of wood and could not be carried on the person on campaign i.e. chess and backgammon. The common solider improvised with what was available to him on the move, dices were made from all types of materials, hammered musket balls, wood, clay bone, etc. Board games were reproduced into leather scroll boards that could easily be drawn on to pieces of leather or cloth that could be rolled up. Sometime these games were drawn into the dirt i.e. games like 9 Man Morris. The most common games were dice (the simple 1 to 6 dot type) followed by card games that could easily be stored into the snap sack.